Adele Laurie Blue Adkins MBE (/əˈdɛl/; born 5 May 1988) is an English singer-songwriter. After graduating from the BRIT School in 2006, Adele signed a recording contract with XL Recordings. 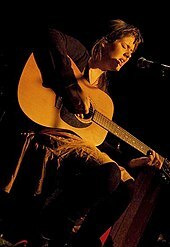 In 2007, she received the Brit Awards Critics' Choice award and won the BBC Sound of 2008 poll. Her debut album, 19, was released in 2008 to commercial and critical success. It is certified eight times platinum in the UK, and three times platinum in the US. The album contains her first song, "Hometown Glory", written when she was 16, which is based on her home suburb of West Norwood in London. An appearance she made on Saturday Night Live in late 2008, boosted her career in the US. 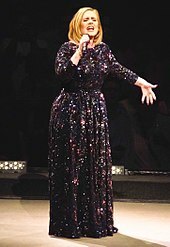 At the 51st Grammy Awards in 2009, Adele received the awards for Best New Artist and Best Female Pop Vocal Performance. Adele released her second studio album, 21, in 2011. The album was critically well received and surpassed the success of her debut, earning numerous awards in 2012, among them a record-tying six Grammy Awards, including Album of the Year; two Brit Awards, including British Album of the Year; and three American Music Awards, including Favorite Pop/Rock Album. The album has been certified 17 times platinum in the UK, and is overall the fourth best-selling album in the nation. In the US, it has held the top position longer than any album since 1985, and is certified diamond. The best-selling album worldwide of 2011 and 2012, 21 has sold over 31 million copies. 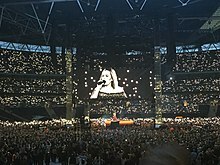 The success of 21 earned Adele numerous mentions in the Guinness Book of World Records. She was the first female artist to simultaneously have two albums in the top five of the Billboard 200 and two singles in the top five of the Billboard Hot 100, as well as the first woman in the history of the Billboard Hot 100 to have three simultaneous top 10 singles as a lead artist, with "Rolling in the Deep", "Someone Like You", and "Set Fire to the Rain", all of which also topped the chart. 21 is the longest-running number one album by a female solo artist in the history of the UK and US Album Charts. "Skyfall" has sold more than five milliion copies worldwide and earned Adele the Golden Globe Award for Best Original Song and the Academy Award for Best Original Song. In December 2012, Adele was named Billboard Artist of the Year, and 21 was named Album of the Year, making her the first artist to receive both accolades two years in a row. Adele was also named top female artist. The Associated Press named Adele Entertainer of the Year for 2012. The 2013 Grammy Awards saw Adele's live version of "Set Fire to the Rain" win the Grammy Award for Best Pop Solo Performance, bringing her total wins to nine. In September 2013, Wiz Khalifa confirmed that he and Adele had collaborated on a song for his upcoming fifth studio album, Blacc Hollywood, though the collaboration did not make the final track listing. 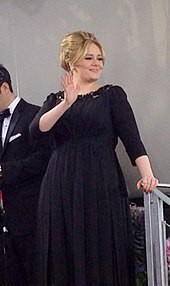 In January 2014, Adele received her tenth Grammy Award with "Skyfall" winning Best Song Written for Visual Media at the 56th Annual Grammy Awards. On the eve of her 26th birthday in May 2014, Adele posted a cryptic message via her Twitter account which prompted media discussion about her next album. The message, "Bye bye 25... See you again later in the year," was interpreted by some in the media, including the Daily Mail and Capital FM, as meaning that her next album would be titled 25 and released later in the year. In 2014, Adele was nominated for nine World Music Awards. In early August, Paul Moss suggested that an album would be released in 2014 or 2015. However, in the October 2014 accounts filed with Companies House by XL Recordings, they ruled out a 2014 release. In 2002, aged 14, Adele discovered Etta James and Ella Fitzgerald as she stumbled on the artists' CDs in the jazz section of her local music store. She was struck by their appearance on the album covers. Adele states she then "started listening to Etta James every night for an hour," and in the process was getting "to know my own voice." 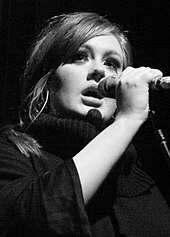 Adele credits Amy Winehouse and her 2003 album Frank for inspiring her to take up the guitar, stating, "If it wasn't for Amy and Frank, one hundred per cent I wouldn't have picked up a guitar, I wouldn't have written "Daydreamer" or "Hometown [Glory]" and I wrote "Someone Like You" on the guitar too." She also states that her mother, who is very close to her, exposed her to the music of Aaliyah, Lauryn Hill, Mary J. Blige, and Alicia Keys, all of whom inspired her as well. She is also a fan of Lana Del Rey, Grimes, Chvrches, FKA Twigs, Alabama Shakes, Kanye West, Rihanna, Frank Ocean, and Stevie Nicks. In 2017, she described Beyoncé as a particular inspiration, calling her "my artist of my life" and added "the other artists who mean that much to me are all dead." Adele cited Madonna's album Ray of Light as a "chief inspiration" behind her album 25. In early 2017, tabloids started speculating that Adele and Konecki had secretly married when they were spotted wearing matching rings on their ring fingers. During her acceptance speech at the 59th Annual Grammy Awards for Album of the Year, Adele confirmed their marriage by calling Konecki her husband when thanking him. She subsequently clarified her marital status in March 2017, telling the audience at a concert in Brisbane, Australia, "I'm married now". Adele is currently a stay-at-home mother. 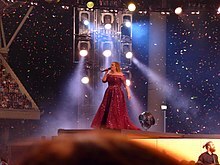 In April 2019, Adele’s representatives announced to the Associated Press that she and Konecki had separated after more than seven years together. Adele and Konecki will continue to raise their son together. Politically she is a supporter of the Labour Party, stating in 2011 that she was a "Labour girl through and through". In 2015, Adele stated "I'm a feminist, I believe that everyone should be treated the same, including race and sexuality". In 2017, Adele was ranked the richest musician under 30 years old in the UK and Ireland in the Sunday Times Rich List, which valued her wealth at £125 million. She was ranked the 19th richest musician overall. ^ Nelson, Jeff; Merrett, Robyn (19 April 2019). "Adele and Husband Simon Konecki Split After More Than 7 Years Together". People. Retrieved 20 April 2019. ^ Fekadu, Mesfin (19 April 2019). "Rep: Adele, husband Simon Konecki have separated". Associated Press. Retrieved 20 April 2019. ^ "Adele's Charity Doesn't Extend To Crappy Beers". The Smoking Gun. 5 December 2011. Retrieved 12 April 2019.